Toddlers are fun to be with at home, but they might feel differently when all of the furniture they see are far too high for them to use. Since they are still lacking a couple of inches, do them a favor by providing a toddler step stool that they can use indoors and outdoors. A step stool is a handy mechanism that provides extra height to both adults and kids. With a step stool, toddlers can brush their teeth, reach the sink and even make potty training easy. Boosting your toddler’s height won’t just negate the hassle on their part. You would also be free from the incessant bugging of your kids to carry them just to reach a high spot. You need to address these questions when shopping for a step stool. There are single-step stools that would be helpful in letting your child reach the sink or dining room table, but still short to get them seated on a chair. Fortunately, you can also choose a two-step stool that provides two landings for more freedom. It will also reduce the risk of your child falling because he/ she is standing on tiptoes to reach something. Other mothers also find it annoying that the step stools they buy get in the way of cabinets and other things. Make sure to buy something that won’t hinder access to cabinets and other furniture, while still giving a boost to your toddler’s height. Don’t forget to measure everything before purchasing anything. The grip should be a priority in choosing a step stool. Choose a product with a non-skid feet and non- slip surface. The non-skid feet will ensure that the stool will stay in place, no matter how much the kid wiggles on top of it. On the other hand, the non-slip surface will reduce the chance of slippage while keeping your toddler stable on the stool. These standard step stools are great for the kitchen, dining room, living room, bedroom and the outdoors. The Bumbo Step Stool has a height of 7 inches and can support up to 110 pounds. This product is incredibly sturdy and has non-slip feet that grips well on wooden floors and tiles. At the side of the stool, you can observe holes, which allow it to be carried around by your toddler without the scratching sound. The top of the portable stool features a rubber surface to keep your toddler from losing his/ her balance, without being rough to the feet. Even when the Bumbo Step Stool is wet, it won’t easily slip or become unstable. A bonus is the wacky aesthetic of looking like an elephant foot. The Greenco Super Strong Foldable Step Stool features a height of 11 inches and supports a total of 300 pounds. It is a handy tool that can be used by both kids and adults around the house. Despite the inexpensive price tag, the product could last for years, as long as it is not subjected to careless use. It features a polka dot non- slip top, rubber feet grip and a foldable design. Its blend of portability and durability makes it worth the investment, but you need to make sure that you are the one to set it up, since kids can injure themselves when figuring out the hinges. The Dreambaby 2 Up Step Stool has a 10-inch height and can support a total of 175 pounds. 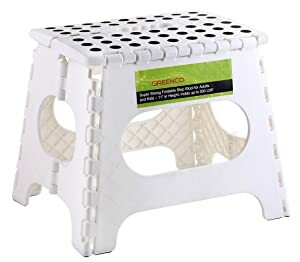 This product features a two-step stool made of durable plastic. It is quite portable and easy to carry since it is light and has side handles. Cleaning it is also not an issue, since a wash cloth is enough to swipe away the dirt from the plastic. The two platforms also feature non-slip rubber for better grip. 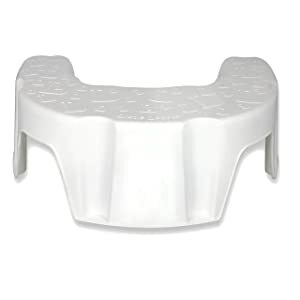 The only downside about the Dreambaby 2 Up Step Stool is the rather small platform at the top. This can only be used for climbing into bed and reaching for things, and not for tasks that take longer to finish. The BABYBJORN Safe Step has a height of 6 inches and looks bright and colorful for kids to appreciate. It features a rubber surface for better grip and a hollowed bottom that makes it lighter and easier to carry. The product is also easy to clean, which is great if it is regularly used outdoors or in wet settings. However, there are flaws in such a design. The height is too short to be useful aside from potty training. The feet of the BABYBJORN Safe Step are also unstable on wooden floors, but work on the tiles. 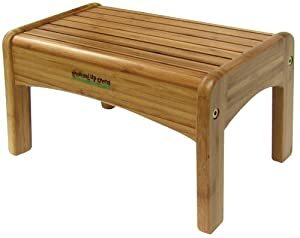 The Growing Up Green Wood Step Stool can support up to 200 pounds and has a height of 7 inches. Aesthetic-wise, this product will fit right in your wooden furniture. Despite being crafted from wood, it is not treated with pesticides for safety concerns. Its polished surface won’t be worrisome, since the toddler can still maintain his/ her balance, with or without socks. There are rubber pads on the feet to avoid getting your wooden floors scratched. The downside of this stool is its heavy weight. 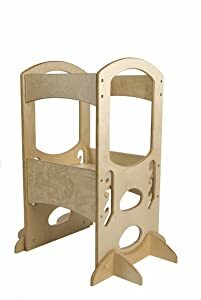 One of the most expensive stools is the Learning Tower Kids Kitchen Step Stool with Safety Rail. It is crafted from wood, making it durable and stable. Its design is rather unique. Unlike a standard stool, it has railings to reduce the risk of your toddler falling backwards. This product is great for kids who want to help out in the kitchen or for chores that take time to finish. However, it might feel restrictive and too bulky. Assembling it also takes 40 minutes at most, but could be shipped preassembled to save you the hassle. The Aluminum Safety Step Folding Step Stool is a tough stool that is 7 to 8.8 inches high. It is lab-tested to support up to 1000 pounds, which makes it a great stool for child and adult use. It features a flat surface that is wider than other platforms in the market. This product is foldable up to 3 inches, so it would be easier to carry for camping or traveling. 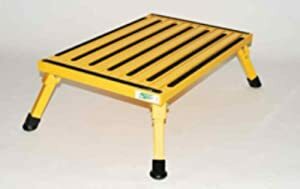 You can also expect the Aluminum Safety Step Folding Step Stool to be durable, while providing long- lasting stability with its rubber leg caps. The following step stools work great in the bathroom, especially when your toddler is trying to be independent during his/ her potty training stage. 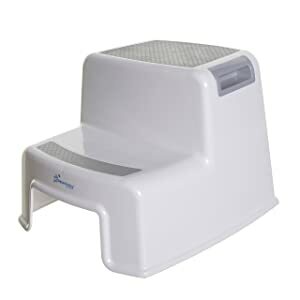 The Summer Infant Little Lobster Potty Training Step Stool has a height of 8 inches. It has a lightweight structure with a curved design, perfect to put around the toilet’s base (with a requirement of 2 inches on either side). It is made of plastic and lacks rubber grips on the feet. The lack of rubber is justified because it makes cleaning easier, especially during the first stages of potty training. The top base has an embossed design for a stable grip, especially when wet. 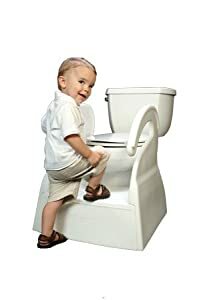 The Toddler Toilet Training Step Stool has a height of 8 inches, with a spacious base for your toddler to position himself comfortably on the toilet. This product comes with removable rails that have a height measurement of 25 inches on both sides. These handles are easy to reach and can secure your toddler’s balance during potty training. 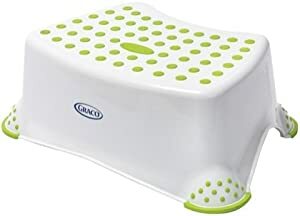 The Toddler Toilet Training Step Stool is made from durable plastic, which ensures a lightweight structure that is easy to clean and carry around. 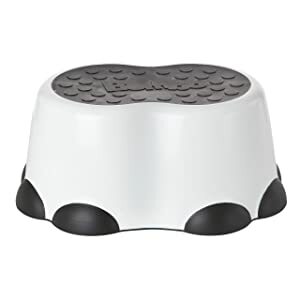 The sturdy product has an expensive price tag, but if you want to invest in stability and durability, this step stool is impressive. The Graco Sure Foot Step Stool has a height of 5 ¾ inches, which is a handy measurement for your toddler to reach the toilet, but not exactly the sink. In fact, shorter toddlers will have a hard time using it, depending on how high your bathroom essentials are. It is one of the cheapest options in the market, but it doesn’t scrimp on quality or durability. The product features rubber feet and a rubber top. On the sides of the every foot, there are also rubber pods which are helpful when the toddler places his foot on it for balance. The Graco Sure Foot Step Stool is lightweight enough to be portable. You will be seeing a wide variety of step stools in the market for toddlers, but with a little research and the insights we have provided, you will quickly determine the best ones from the rest. In fact, the products we have reviewed here are the best options in the market at the moment. 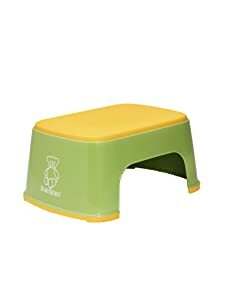 Bear in mind the location where you will be using the toddler step stool and you can surely pinpoint what product will suit your child’s needs.